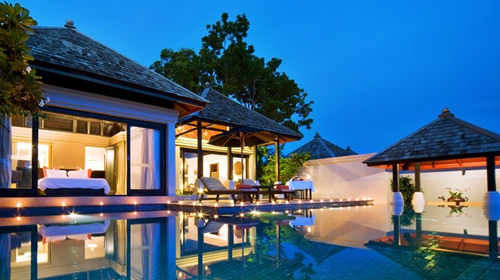 As part of our Thailand trip we spent 3 nights at this gorgeous and very secluded resort. We have looked after us perfectly from the first minute and felt lifted. We had booked an ocean view pool villa, with its 310m ² with private pool and stunning views of the Andaman Sea are already took his breath away. The private pool is in size, so much so that you can actually swim and not just splash around, it measures 12X4 m. The huge, spacious villa is very modern and leaves no wish unfulfilled, very nice is that it is very spacious and not cluttered acts .. Ipod and DVD etc.gehören to standard. The villa has a kitchenette but we did not use it except for tea and Kaffeeekochen. The service of the staff is great: when my husband was ill overnight, nursed him to several times a day with homemade Thai tea, called several times and was taken care of his well being that it was already almost touching. That there are other guests at all, you realize only at breakfast, which is served together in the reception house, or in the evening in the great 360 degree bar with a cocktail or dinner. Otherwise, one is in his "home sweet home" absolutely separated and can fully enjoy the rest: this is pure relaxation! Also we have there, we did a Thai cooking class with the chef and an assistant chef at the resort, an absolute fun and tasty to! Those who wish can be brought to the beach, we did not use this service, even though we have come into the Laguna Shopping Center drive, the other time we have enjoyed the luxury and relaxation in our quiet, spacious villa, which I mention yet want the program for the spa in the villa staff is great too: I have two hours enjoyed in our villa a fantastic program of facial with European products to the classic Thai massage.